Advantix II is the next generation of the original topical pest control as developed by Bayer. This product is taking traditional Advantix flea and tick control to the next level. K9 Advantix II for Dogs is for the topical prevention and treatment of ticks, fleas and mosquitoes. For monthly use on dogs and puppies 7 weeks of age and older. 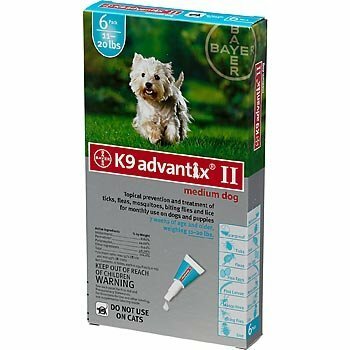 The entire contents of K9 Advantix II tube should be applied evenly to two or three spots on the top of the back from the shoulder to the base of the tail. At each spot, part the hair until the skin is visible. Place the tip of the tube on the skin and gently squeeze to expel a portion of the solution on the skin. Be careful not to apply an excessive amount at any one spot so it does not run off the sides. For larger Dogs, apply the entire contents of the applicator tube to 4 or 6 spots on the top of the back from the shoulder to the base of the tail. Note: In households where both Dogs and Cats are present, separate a treated Dog for 24 hours until the product is thoroughly dry. Side Effects may include: Itching, burning sensation, scratching and redness. Symptoms should dissipate within 48 hours; however, if your Dog is experiencing an adverse reaction, bathe immediately and consult your Veterinarian.